Chateau Ste. 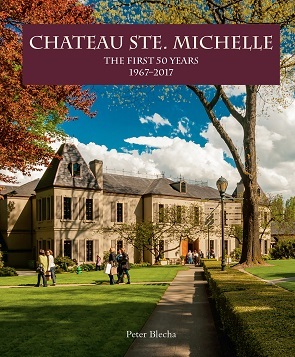 Michelle, Washington State’s founding winery, continues its year-long 50th anniversary celebration with the recent release of its coffee-table style history book, “Chateau Ste. Michelle: The First 50 Years (1967-2017).” The beautifully illustrated hardcover book, featuring more than 100 pages of Washington wine chronicles, details the rich story of the state’s wine industry and Chateau Ste. Michelle’s leadership in bringing it to the forefront of the American wine industry. While supplies last, the book will be available for purchase for $30 on site at Chateau Ste. Michelle’s wine shop or online at www.ste-michelle.com. Over the past 50 years, Chateau Ste. Michelle has become the number two premium domestic wine brand sold in the U.S (Nielsen-Dollars), with wines available in all 50 states and more than 100 countries. As a whole, Washington is also the nation’s number two producer of premium wine, with more than 60,000 planted acres, nearly 1,000 wineries, and 14 American Viticultural Areas (AVAs). These successes have been due in large part to the cultivation and fostering from Chateau Ste. Michelle and Ste. Michelle Wine Estates. The book, which illustrates its prolific history in the industry, also denotes how Chateau Ste. Michelle has fostered the trade and promoted continuous growth, through avenues such as its Ste. Michelle Wine Estates Washington State University Wine Science Center, as well as its Chateau Ste. Michelle Scholarship Fund. All proceeds of the “First 50 Years” book will benefit the Chateau Ste. Michelle Scholarship Fund, which has awarded 142 scholarships to support high-achieving, underrepresented minority college students throughout Washington, totaling $3.2 million since 2002. Students in the program, administered by the College Success Foundation, have an 85-90 percent graduation rate. Chateau Ste. Michelle partnered with HistoryLink on the book, given its expertise and passion for researching and sharing the stories of Washington’s history. The book’s author, Peter Blecha, combed through the state’s meticulous archival records as well as the winery archives, in addition to conducting numerous interviews to tell the stories of the people and events that helped shape Chateau Ste. Michelle and the Washington state wine industry. The book, now available online at www.ste-michelle.com/shop, is available for purchase for $30 as well as in-person at the Chateau Ste. Michelle wine shop at 14111 NE 145th St. The ISBN is 978-1-933245-47-8 and was edited by Chris Boutee with Company B, and designed by Paul Langland Design. The author of the book is Peter Blecha, and was produced by HistoryLink and Documentary Media LLC. To follow along with other 50th anniversary updates, including the recent history book release from Chateau Ste. Michelle, please visit www.ste-michelle50th.com or follow Chateau Ste. Michelle on Instagram: @chateaustemichelle, Facebook: Ste. Michelle, Twitter: @stemichelle and the conversation at #CSM50.